Of the list, I'd say I could do a good handful with my eyes closed (diaper, comfort, orders, manure, cooperate, act alone, and cook), a few under the gun (hog, sonnet, accounts, wall, equations, analyze, fight, die) and the rest not at all!! 1. Put butter in a heavy frying pan or a shallow casserole. Place in a oven preheated to 475F. 2. Meanwhile, mix milk, flour, and eggs lightly to make a batter. 3. When the butter has melted, add batter to pan and bake for 12 minutes. 4. Pour a little of the melted butter onto the pancake and squeeze a little lemon juice to taste. Sprinkle with confectioners sugar and serve immediately. 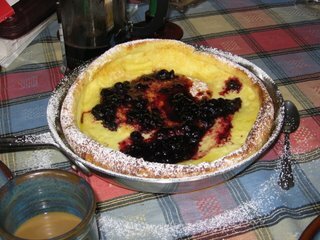 Variations: Spread with a fruit preserve or fresh berries; sprinkle with Grand Marnier; maple syrup mmmmmm. Enjoy! And welcome to my new blog, by the way. Stay tuned for a great time. Hey Aimee! This is great. I'm looking forward to reading more of your posts and trying out your yummy recipes. this is what I want for breakfast on Sat!